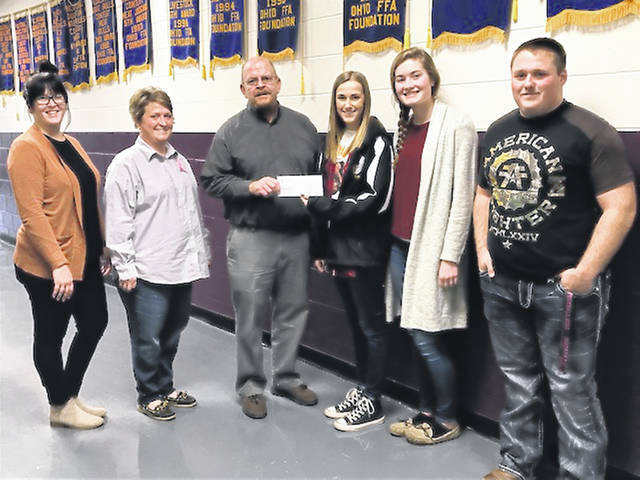 The Mechanicsburg FFA dedicated the month of October to raising funds for the Cancer Association of Champaign County. For the entire month the chapter sold meat sticks and gave the profits to the CACC. On Oct. 18, the chapter held a Potato Bar for all Mechanicsburg staff for a donation to the CACC. In total $500 was raised for the CACC. All money collected by the CACC stays in Champaign County to be available for cancer patients. CACC provides medication, treatment assistance, gas cards and prosthesis. To reach the CACC, call 937-653-3899. In the photo representing the CACC are, from left, Whitney Denson, patient services, Stacey Neer, treasurer, and President Brett Evilsizor. Handing the check to Evilsizor is Mechanicsburg FFA President Taylor Ayars along with Vice President Elly Schipfer and Sentinel Levi Adams.